If one goes to sleep on one's side, then one's head ends up a few centimetres above the surface one is lying on, a distance equal to the breadth of one's shoulder. Modern man usually uses a pillow to bridge this gap, but the ancient Egyptians used a headrest. This piece of furniture consisted of a semicircular upper section placed under the skull, just above the ear, and one or more columns raising the upper part to the right height. The use of a headrest not only ensured a relatively comfortable position while sleeping, but also enabled air to circulate around the head, an added advantage in a warm climate like that of Egypt. 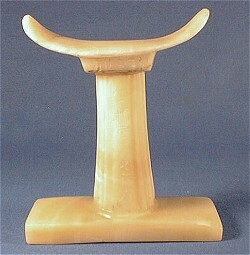 Headrests are known from the very beginning of Egyptian history; most of them are made of stone (particularly in the Old Kingdom) or of wood. Many of them are decorated. Depictions of protective gods such as Bes and Taweret, who banished evil from the dark night, were particularly popular, although other motifs also appear. The most beautiful example is a headrest belonging to Tutankhamun, whose column has been replaced by a depiction of the god Shu, lifting up the head, identified with the sun. On either side of him are two lions, which have been identified as Aker or the lion pair Ruty, the personification of yesterday and today, or Shu and Tefnut. Not only the living used headrests; it was an essential part of the burial equipment, and was also regularly illustrated on sarcophagi. After all, the deceased was regarded as a sleeper. A spell in the Book of the Dead clearly shows that the lifting up of the head of the mummy was linked with the resurrection (compared with getting up after waking up). Further, the headrest was meant to prevent the deceased from losing his head in the hereafter. For this reason, miniature headrests were often placed into the mummy wrappings as amulets.